Let’s all agree that “outsider artist” is a term of convenience, encompassing the self-taught, the visionary, the geographically isolated, the mentally ill or developmentally disabled, and (in one memorable episode) Homer Simpson. And in that spirit, we must judge the Outsider Art Fair, now celebrating its 20th anniversary, not by its title but by the vitality and variety of works on offer. 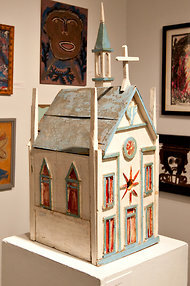 Aldo Piacenza’s church of wood and metal at the Dean Jensen Gallery’s booth at the Outsider Art Fair. Tin-foil animals by Dean Millien at the LAND Gallery’s booth. The fair has drawings by famed outsiders like Henry Darger as well. The thread linking the fair’s 36 booths is a personal compulsion to make art, without a rulebook and with whatever materials happen to be at hand. At Marion Harris, for instance, are tiny peach-stone carvings by A. W. Gimbi, a 19th-century barber from McAdoo, Pa. They make up a none-too-practical tool kit of hammers, corkscrews, fishing hooks and other utilitarian objects — each no more than an inch in height. At Lindsay Gallery, charts drawn on rolls of oilcloth by a Pentecostal minister, the Rev. Samuel David Phillips (1890-1973), illustrate sermons in a naïve hand but with plenty of preacherly imperative. You imagine the members of his flock sitting bolt upright in their pews after gazing at “Rome,” which depicts a bloody crucifixion, the flaying of St. Bartholomew and a pack of lions feasting on martyrs in the Colosseum. The nightmarish scenarios in Penny Rockwell’s solo presentation at Pavel Zoubok tell a very particular story of mental illness. During a psychotic episode three decades ago, Ms. Rockwell had visions of electrical plugs bursting into flame; she eventually checked herself into Bellevue. After treatment, she started to confront her fear in black-and-white drawings and collages. In the most gripping of these works, the plug is a dragon-like creature that breathes flame from fraying wires. If Ms. Rockwell’s drawings stoke anxiety, a group of drawings by Jim Work, at the Pardee Collection, seem meant to soothe it. Mr. Work, a developmentally disabled artist born in 1944, renders neat ribbons of highway and tidy brick houses in cheerful pink and green crayon on paper grocery bags. He seems to be guided by an inner GPS, drawing arrows on the roads to indicate the direction of traffic. In some cases, familiar names are presented in new ways. The proprietor of MAKE Skateboards, Scott Ogden, is selling limited-edition skateboard decks that feature authorized reproductions of art by Adolf Wölfli and Royal Robertson. With Robertson, a Louisiana sign painter who believed in space aliens and the apocalypse, Mr. Ogden found an artist who easily crosses over from outsider to street art. Also new to the fair are some high-profile institutional collaborators. One is the Collection de l’Art Brut, the Lausanne, Switzerland, museum of outsider art that houses some 5,000 works amassed by Jean Dubuffet, here showcasing its series of DVDs and monographs on outsider artists. Another is El Museo del Barrio, which is timing the opening of its show of “nontraditionally trained” artists, “Testimonios: 100 Years of Popular Expression,” to coincide with the fair. And as in previous years, the American Folk Art Museum is holding a series of talks. Then there is an exhibitor called the Museum of Everything, which isn’t really a museum but rather a series of exhibitions of outsider art organized, and lovingly preserved in book form, by James Brett, a London curator. For this fair, Mr. Brett has designed an attractive bookshop in which real shelves emerge from a trompe l’oeil wall drawing. Leafing through the four volumes of the Museum of Everything’s limited-edition catalog, you can read musings on outsider art by consummate contemporary-art insiders (Maurizio Cattelan and Carsten Höller among them). 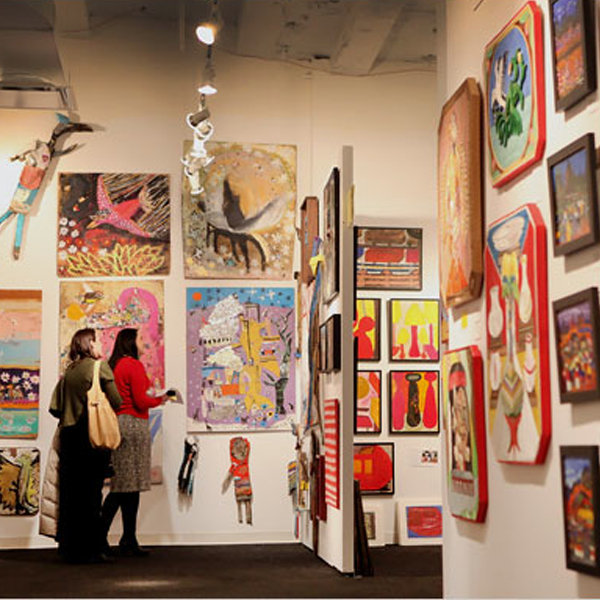 The Outsider Art Fair continues through Sunday at 7 West 34th Street; sanfordsmith.com. A version of this review appeared in print on January 28, 2012, on pageC1 of the New York edition with the headline: Creating Artworks Without a Net.